Centre for Rural Development is the first organization working on Carbon Foot Print in North East India, under UNDP Sustainable Development Goals. 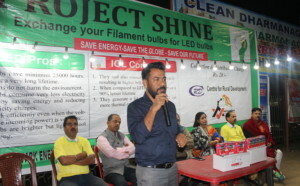 We are working on Project called SHINE-LED supported by Bright Spark Energy Pvt. Ltd. Pilot project has been started in Dharmanagar North District of Tripura, goal of this particular project is to reduce Carbon Emission. 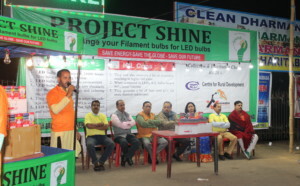 We have covered 3,200 households and distributed 9600 Led bulbs. Through this particular project we are replacing ICL bulbs with LED bulbs. 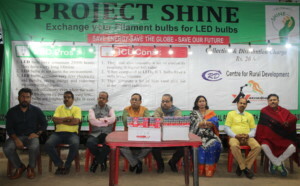 In our pilot project we have distributed 9600 LED’s, 4800 – 14 Watt LED bulb against 100 Watt ICL bulb & 4800 – 9 Watt LED bulb against 60 Watt ICL Bulb, 412800 – saving electricity against -14 Watt, 44800 – saving electricity against – 9Watt. In this way we are saving 6,57600 Watt per hour electricity for state. In this way we are saving 6,57600 watt per hour electricity for state.